Jackpot Capital Casino has just started another big casino bonus event. This time, $80,000 will be given away and the best news is that you don't have to be a really frequent player to win. During the Time Travelers casino bonuses event, players will be travelling from the 21st century, back to the medieval period, ancient times and finally the dinosaur era winning weekly casino bonuses up to $500 each. Half of the prize money will go to players at the top of the Scoreboard but the other half will be awarded in random draws. Play at Jackpot Capital and you'll earn points whenever you play and wager. You'll be ranked on a Scoreboard and every week until June 15th, if you're one of the top 200 players, you'll receive bonuses up to $500. As you accumulate points you'll move up through four stations. Every week, randomly drawn players at each level receive Station Prizes from $100 - $500. Since only some players make it to the top level, odds of winning are better for those that do. 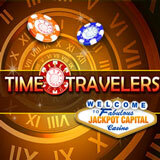 Everyone can win casino bonuses during Time Traveler event. Jackpot Capital Casino, which welcomes players from all over the world, has hundreds of games from Realtime Gaming. Its mobile casino for smartphones and tablets has dozens of mobile slot games plus blackjack and keno.